We have more than 25 years of traffic and criminal law experience. 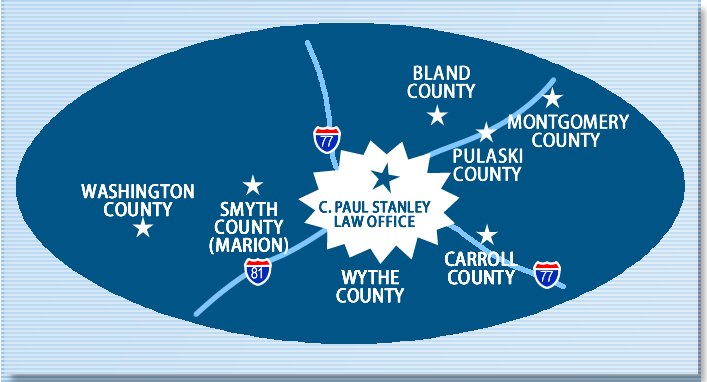 We serve the Virginia Counties of Wythe, Bland, Carroll, Smyth, and Pulaski. Since 1993, we have assisted numerous clients in obtaining dismissals or reductions of their traffic offenses, in many cases our client’s charge can be reduced to a non-moving violation to avoid points on their driving record. Telephone and Internet consultations are always FREE with no obligation. We will provide you with an immediate quote for your consideration. We do all the work and appear on your behalf whenever possible. It’s that simple. We Help You Fight Tickets! This year in the USA, over 35 million people will get speeding tickets. Most people are unaware that they do have a right to challenge or contest their ticket. Many traffic violations are uncontested in court, causing the driver to pay higher insurance premiums and accumulate points on their driving record. Over 25 years experience has provided us with the background and expertise to skillfully navigate the court system for you. We understand what it takes to minimize or eliminate your ticket. Get more information by clicking here today. Are You A Member of These? How Does A VA Traffic Violation Affect You? Designed by PRONETS, Inc. | © 2019 - C. Paul Stanley, Attorney at Law, P.C.